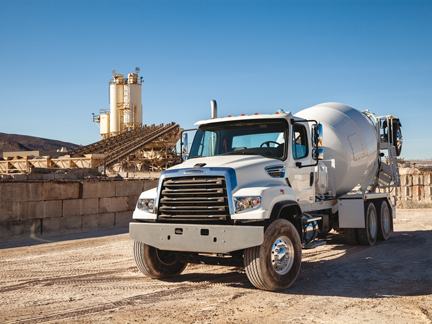 Freightliner Trucks showcased an innovative array of vocational solutions at World of Concrete 2019, held in Las Vegas January 22-25, 2019. An all-new option was on display for the first time at World of Concrete: The Freightliner 114SD concrete mixer specified with the new Cummins X12 engine. Up to 270 kg lighter than other medium-bore engines in the 10-13 l category, the Cummins X12 engine is made to increase payload and productivity. Paired with the durable 114SD, this powerful combination is ideal for applications where weight savings are a priority, such as concrete mixers, dump trucks, cranes and more. A second X12-powered 114SD was showcased in the McNeilus Truck & Manufacturing. In addition, visitors to the Freightliner booth had access to a variety of bodied-up trucks on display, including 114SD concrete pumpers, cement mixers, volumetric cement mixers and more. The Detroit DD8 and DD13 engines were also on display at the booth.